Happy July 1st everyone! Nothing monumental happened today, but at least the weather was truly beautiful. If every day had weather like today, my attitude would be significantly more cheerful. I started a new sock monkey today and am determined to finish it in less than a week this time. 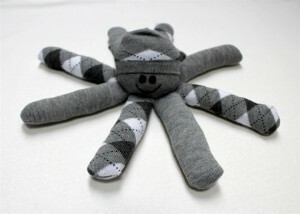 I finished a Socktopus this morning and it is posted in the giggleFritz shop and Etsy Shop. That Socktopus should have been for sale last week, but I did not make myself sew on the last leg and apply his face. Well, done, done, done. It’s time to get hoppin’! Last week I sent in my registration papers for this year’s Coffee Break Fest craft fair in Stoughton, Wisconsin. It is my favorite craft fair of the year! I am a little bummed I won’t be able to sample the coffee in the contest this year (no caffeine, Prego Girl!!). I love the people and the car show and hope it’s a great Festival this year. Oh, and no rain! I am off to catch the rest of the Milwaukee Brewer’s game and some Duck Dynasty with my husband.